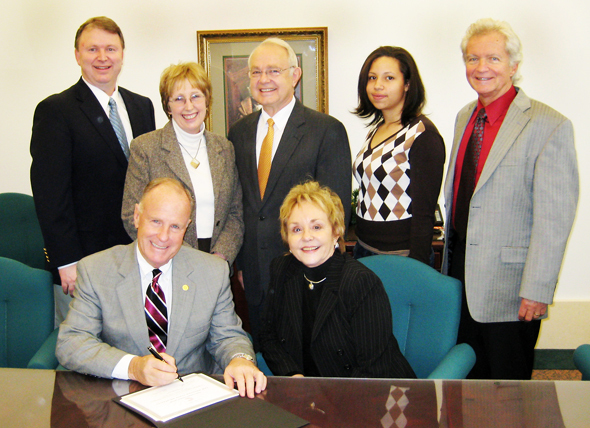 Signing the Texas Campus Compact agreement were, seated from left, Jim Gaertner, SHSU president, and Jill Binder, TXCC executive director. Also present were, from left, Dr. David Prier, Joyce McCauley, David Payne, Tuesde Cavil and John de Castro. Almost 100 years after President Harry Estill approved the inscription of Sam Houston State's motto--"The measure of a Life is its Service," on an Old Main chapel window, President Jim Gaertner has taken another step in that tradition. On Monday Gaertner signed an agreement that made Sam Houston State University the 53rd member of the Texas Campus Compact, which is part of a national coalition of more than 1,000 college presidents committed to "the civic purposes of higher education." According to the TXCC Web site, the organization "promotes community service that develops students' citizenship skills and values, encourages partnerships between campuses and communities, and assists faculty who seek to integrate public and community engagement into their teaching and research." Jill Binder, executive director of the state group, came to the SHSU campus to sign the agreement. She also met with SHSU's American Democracy Project committee and discussed how the national and state groups evolved. "Education was begun in this country to make sure our democracy continued," said Binder. "But it evolved to a point that education was primarily the way to get a good job." Some 21 years ago the presidents of Brown, Georgetown and Stanford universities met to ponder the question, "What are we doing about democracy," Binder said. The result was formation of a national organization, and in June 2001, a Texas state organization. "Getting a good job is not the only purpose of Texas Campus Compact member institutions," Binder said. "There is another important aspect of life--citizenship and public service." Participating in the signing ceremony were several individuals representing SHSU's community service commitment as well as one from the community representing service opportunities. David Payne, SHSU provost, has been a campus leader in encouraging organizations and individuals to do community service and faculty members to include service learning in their courses whenever practical. Joyce McCauley has chaired the American Democracy Project committee since Payne created it in 2004. The ADP has a Web site and has been involved in a number of activities and events that are explained there. John de Castro, dean of the College of Humanities and Social Sciences, is heading a relatively new ADP sub-group called the Political Engagement Project. Tuesde Cavil is one of the ADP student members. In addition to learning how to be good citizens in classes that use service learning teaching concepts, SHSU students can keep track of community service through a co-curricular transcript, an official university document that can be useful in getting a job. Dr. David Prier represented Huntsville's Promise, an organization that monitors needs of the community and is a key to university/community interaction. Gaertner, in the speech he gave at his inauguration as Sam Houston State University's 12th president in February 2002, outlined three areas of focus for his presidency. One was to better the relationship between the SHSU and campus communities. Monday as he signed the agreement to join the Texas Campus Compact, he repeated that pledge. "We'll be good members," he said.